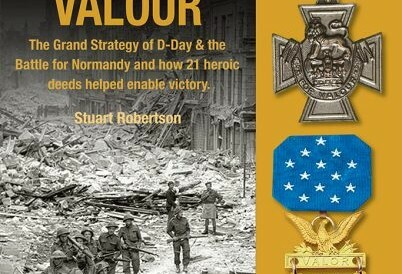 Not just another D-Day book – Why is this book unique? 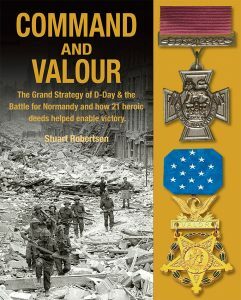 With D-Day and the battle for Normandy being one of the most written about episodes of military history, it would be easy to assume that after 75 years had passed, that generations of historians would by now, have reached a consensus as to who were the leading protagonists in leading the way for the western Allies most famous victory during the Second World War. It is indeed amazing to consider that many of the most commonly held perceptions of what exactly happened in 1944 are nothing but deeply ingrained myths, repeated so often that they now go unchallenged. In ‘Command and Valour’, the author addresses these myths head on, and without taking prisoners, readdresses the truth of the battle reaching conclusions which may surprise many of those who thought they already knew all there was to know on such an iconic subject. Alongside this story, the author recounts, for the very first time in a single volume, the instances of incredible valour which led to the 21 Victoria Crosses and Medals of Honor to be awarded during the Normandy campaign. Stuart Robertson is a history graduate of Manchester Metropolitan University and the University of York St. John. Since 2004 he has worked as a full-time historian and battlefield guide based in Normandy, France. During this time, Stuart has written numerous works focusing on D-Day and the subsequent campaign in North-West Europe and has provided consultation to and has carried out research work for national and international journals and broadcasters. In 2015, Stuart was elected to the membership of the Royal Historical Society.